The Power On/Off Button activates the unit. Every press of the upper( + ) Output control button illuminates 1 of the 5 LED lights increasing the output and the left side ( - ) decreases in the same manner. 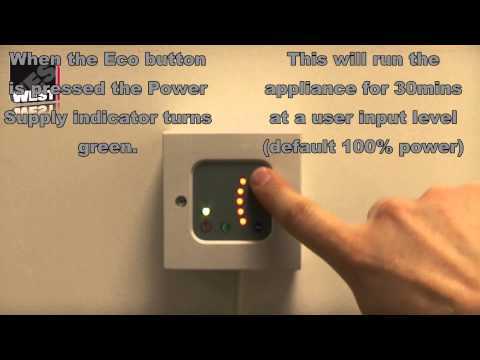 The Eco button switches the unit to a higher power setting for 30 minutes (to heat the towel rail) the power level can be set in the first 30 minutes then switches to a lower pre-set power for 90 minutes (again this level can be adjusted during this phase). After 2 hours the controller will turn off. Both the 30 and 90 minute setting are saved in the controller.